Please send all enquiries to Ben Page. We are currently scheduling dates and venues for our next series of courses in 2018. If you haven't already registered your interest please do so now. Further information will published here and in our newsletters, as well as on our Facebook page. 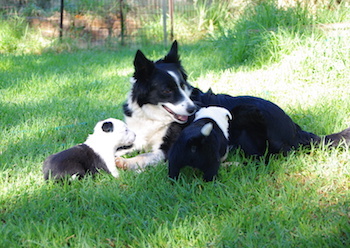 The Working Dog Centre strives for excellence in breeding and training. We breed and train working dogs, train handlers, supply dogs to clients, educate the public in the benefits of using dogs to work livestock, and use our working dog knowledge and expertise to assist industry and the media. Ben Page’s Natural Method® works with the dog’s natural instinct, using ‘dog language’ to teach the dog. Ben does not use force or aggression and does not condone cruelty or believe in swearing or losing your temper whilst training your dog or working stock. Our dogs come from proven bloodlines with extensive pedigrees going back at least 10 generations, and are used on sheep, beef cattle, dairy cattle, goats, ducks, poultry and in sheepdog trials. Find out more about Buying A Page Dog. The Secret Of Teaching The "Stop"
"I have been a professional educator at the tertiary level for over 45 years. My involvements have been in 5 continents and over 40 different countries. I have never seen such a well run course with such tangible benefits and excellence at the practical level." "Fantastic course Ben, you really take such a simple approach that makes it seem achievable." "I was enthralled from start to finish. Can’t wait to get a good dog and get on with it all." "Thank you so much for a fantastic course. Great teaching methodology, and most importantly clear and systematic instructions for working with your dog. A wonderful course." It has been wonderful to learn the science behind working dogs, from someone who loves his dogs with such a passion." The Working Dog Centre conducts Working Dog Training Schools at three levels: Fundamentals, Intermediate and Advanced. Courses are open to anyone who owns a Working Dog. Higher level courses are open to clients who have successfully completed the previous level. Booking for our Training Schools has never been easier. Our new streamlined booking system means you can book and pay for your course securely online. If you aren't online and need to arrange an alternative payment method, please get in touch through our Contact Form.